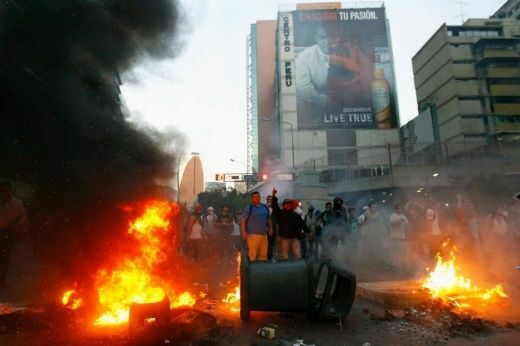 Opposition supporters destroy a metro stop during 2014’s guarimbas. (Credit: Alba Ciudad/Telesur English). 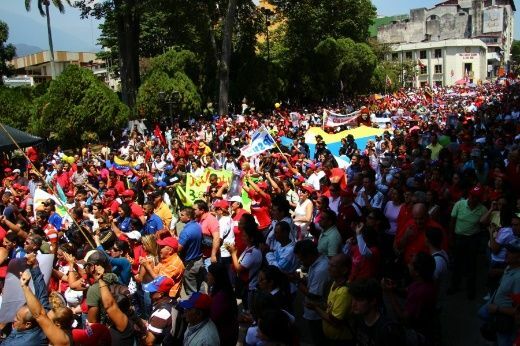 At one year since the violence opposition barricades in Venezuela that aimed to bring down the democratically elected government, teleSUR reviews 11 things the media kept secret. “If the guard makes a mistake and represses someone who is insulting him, in just minutes the video is doing the rounds of Youtube, it will be seen by millions of people and will form part of multimedia material that arrives at international chains such as CNN, NTN24 Caracol and others,” he explained. Yet these brief snippets aren’t representative of the general conduct of the GNB. For example, in the second week of March 2014, El Nacional newspaper and opposition politicians spread a story of how the GNB supposedly repressed a peaceful protest in Lara state’s National Poli-technical Experimental University. Luckily for the GNB involved, a local independent journalist filmed the entire confrontation. The video shows the GNB negotiating with guarimberos, before giving them a short workshop on human rights and releasing them. The private media didn’t tell the world about that, nor did they describe how many nights, while the barricaders slept, communities would go out and try to clean up the mess. Gisella Rubilar was shot and killed by men in balaclavas on a motorbike, while helping to clean up. 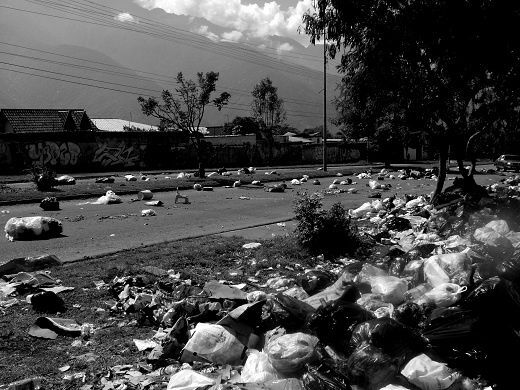 The (at the time) Chavista city council and grassroots organizations also organized a number of mass clean-ups, with the national guard tanks clearing the big obstacles, and the council providing trucks for removal of debris. Hundreds of communal council members, PSUV and PCV activists and more would join in these 5am clean-ups, sometimes singing to Ali Primera as they did, while opposition supporters watched on and booed and yelled at them. (Tamara) Chavistas, non-political people, and even the peaceful opposition suffered the psychological effects of the constant violence, insecurity, and fear, but the media were more interested in the far-right, whiter, upper-class sectors, and didn’t cover this. It didn’t suit their message. I remember walking in the street, being scared, when people on motorbikes holding long things drove past, or there were groups of young men talking in the street – because they resembled barricaders. We were scared to take photos, to meet or march too, since snipers had killed people at a march in Bolivar – of course, we did anyway. A doctor friend would walk three hours through barricades to get to the hospital, and be scared every time she crossed one, because they would yell out sexual abuse, beat up people, or demand large bribes to be able to cross. Once we tried to leave our barrio late at night to work, and because we weren’t participating in the caceroles – weren’t banging pots, neighbors we didn’t know yelled at us, “Go to hell, Chavistas, die!”. 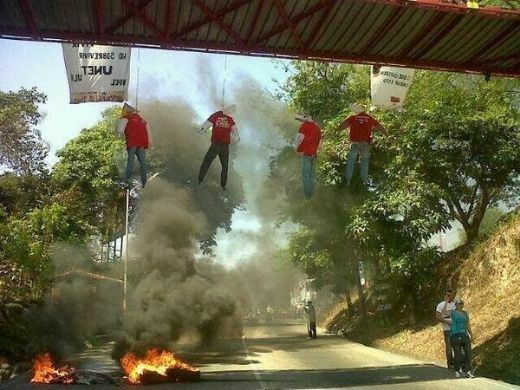 Chavista effigies were hung off bridges. Another friend had a heart attack because his son had been stuck at home for weeks due to death threats. It became an act of courage to wear a red t-shirt in the street. A lot of public institutions were attacked, burnt, had windows smashed. An explosive was thrown at a Mercal food store in San Cristobal, the governors’ residencies in San Cristobal and Merida were attacked, Chavista ULA students were attacked, ambulances trying to take people injured at the barricades were attacked, a man was half striped and tied to a tree and humiliated, a gas truck was burnt, as were many buses and private vehicles including food delivery trucks, various of Merida’s new free tram stops were destroyed, some of the Bolivarian universities were ransacked, burnt, or wrecked, the housing ministry in Caracas was burnt, Merida’s water was poisoned, a national park was set on fire, 5,000 trees were chopped down for the barricades, metro bus stations were wrecked. In Lara, they tried to burn Cuban doctors alive, and all up, there were 162 attacks registered on Cuban doctors. In early April, before the guarimbas were over, Maduro calculated total damages at US$15 billion. But how do you calculate the long term damage on human beings caused by constant fear and loss? (Ryan) Yet the opposition’s violence rarely seeps into international media coverage, despite the death toll from the 2014 unrest undermining claims the guarimberos were peaceful. In an op-ed for the New York Times in March 2014, opposition figure Leopoldo Lopez claimed, “More than 1,500 protesters have been detained, more than 30 have been killed.” To its credit, the NYT issued a correction admitting the figure of 30 deaths “includes security forces and civilians, not only protesters,” but didn’t go into details. So what does the actual death toll look like? This isn’t true. The “protests” began in the first week of January 2014, when a few dozen masked individuals began barricading the main road outside the University of the Andes (ULA), and burning tires. For the first week, the masked individuals drew no police attention, and were left to block the street and harass passerbys. Buses carrying residents of the working class barrios uphill from the ULA were forced back. Without the buses, it became difficult to reach the city center from the barrios, and it was a common sight to see poor retirees slowly walking up the hill past the ULA, carrying their shopping in the tropical heat – while the “peaceful protesters” looked on. The protesters carried small arms, and weren’t afraid to draw them on anyone who complained. 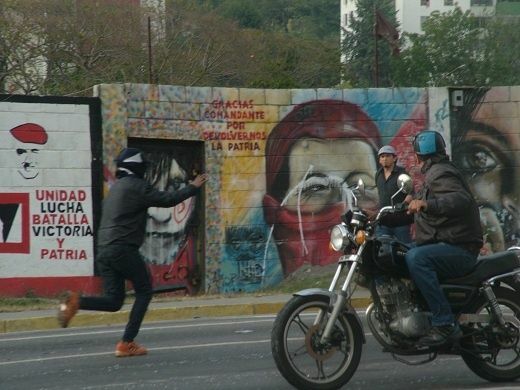 When the police began trying to clear the barricades, the guarimbas would hide in the university and throw rocks. Once the officers left, they would quickly rebuild. This was the prototype of the kind of urban fighting that would be employed across Venezuela a month later. 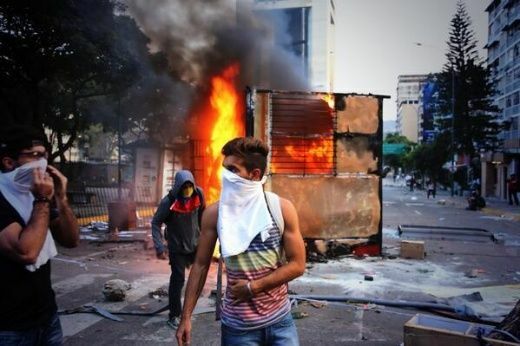 The media failed to explain this, and did not explain any of the context behind the guarimbas: upperclass and business discontent with a revolution and national government that favored (and favors) the poor, the failed opposition coup in 2002 and many opposition electoral loses, including one just months before – seeing them desperately seeking other means to gain power. (Ryan) A major part of the reason why the international perception of Venezuela’s opposition is so skewed is because of the voices presented in the Western media. While ordinary, working class Venezuelan voices rarely appear in the international media, right-wing fanatics are often presented as experts. Take Caracas Chronicles co-founder Francisco Toro, whose work was described by Associated Press in 2014 as “a must-read for foreign journalists, academics and political junkies.” One of Toro’s last regular articles for the blog he founded was penned on January 20, when he broke news of a “tropical pogrom” where protesters in middle class neighborhoods were supposedly massacred by pro-government “paramilitaries” the night earlier. The article went viral on social media, despite the fact that still todaythere is no evidence of any mass killings on February 19. The “tropical pogrom” never happened, but Caracas Chronicles continues to be taken as a credible source of information by the mainstream media. For example, in a January 2015 edition of Al Jazeera’s The Stream, Caracas Chronicles blogger Emiliana Duarte Otero joined a panel of academics and a student activist to discuss Venezuela’s economy. She used the opportunity to warn that Venezuelans could start going hungry within months, labeled one of the other guests (George Ciccariello-Maher, an Assistant Professor of Political Science at Drexel University) an “agent of communism” and claimed “every single supermarket” in Venezuela has military personnel monitoring “ration” distribution – of course, completely false. (Tamara) The opposition barricades meant that for months, people couldn’t get to schools or hospitals. One friend couldn’t get medicine to her sick, elderly mother. Other people couldn’t get to the social security center for vital medicine, such as insulin shots. Schools – primary, high schools, and universities – near the main guarimbas were closed for months, denying children their human right to education. A few schools held classes in alternative venues, when they could, including a meeting room in the workers’ hall. The media ignored all this. (Ryan) One of the main complaints from Venezuela’s opposition was regarding scarcity of consumer products, yet their main “protest” strategy was to block roads. By blocking roads, the opposition inevitably impeded the transportation of consumer products. Unsurprisingly, the height of opposition unrest was accompanied by a spike in scarcity. For me personally, the logic of this was rammed home one March morning, when I passed a shuttered supermarket with a torched out semi-trailer out front. 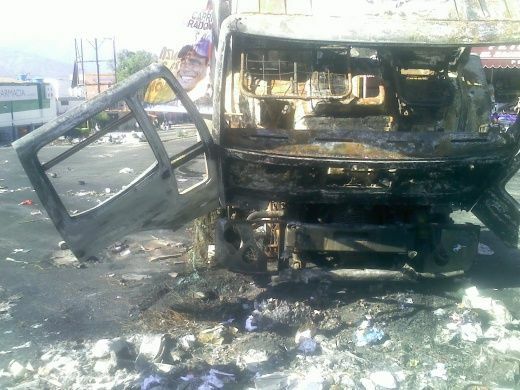 The burned truck was graffitied with anti-government slogans and had an opposition electoral poster slapped on the side. A few minutes further down the road, there was more anti-government graffiti complaining of scarcity. Again, the media ignored this. 11. People still organized, despite it all, and continue to do so. (Tamara) Most importantly, what the media doesn’t want anyone to know is that the guarimbas failed. There were weekly marches around the country demanding an end to the violence, and the Chavista’s main form of resistance to it was to keep on working on their media, education, health, and community projects – projects they are still working on one year later. The alternative school I taught at still held classes, though I couldn’t go because the two main entrances to the barrio were blocked by armed barricaders. Despite no public transport and all the fear, hundreds of us met in the main cultural hall to discuss a collective response to the violence. 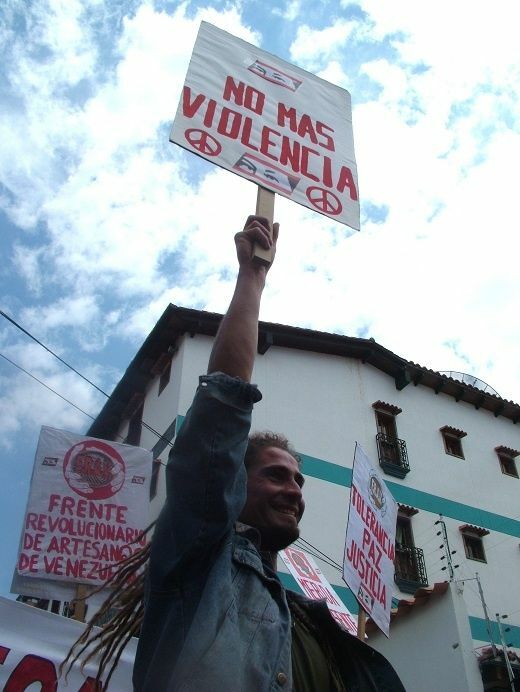 While the media demonized the “collectives,” portraying government supporters and grassroots organizations as violent, and the opposition as peaceful, the pro-government youth organized regular cultural events in the main plaza to counter the violence. The collective patience in the face of abuse was, and continues to be extraordinary.